The magic was all in the finishing touches, the painter thought as he lightly stroked in the gold edges of the blood red camellia, nestled in the mahogany of the woman’s hair. She was beautiful with a grace and femininity immediately obvious, despite facial features being hidden. She was turned towards darkness, the fingers of one hand trailing through the ether and the fingers of another hitching the hem of her dress up her thigh, revealing café au lait skin that you couldn’t resist wanting to reach out and touch. It was his finest work. Andreas stepped back from his easel, the backs of his legs butting up to the mattress in the sterile hotel room he’d rented. The sheets were crisp with regulation hospital corners; the lamp was nondescript and clinical; even the arm chair reeked of manufactured sameness and probably hailed from somewhere like Ikea. Not that he had anything against Ikea but a room full of franken-furniture wasn’t exactly where he’d wanted to paint her or to get piece himself back together. He’d flown to London from Madrid just a few nights ago in desperation, packing only a few barebones essentials, in an attempt to find Aurelia and make things right again. As he gazed at the naked skin of her upper back and contemplated whether or not to add in some sort of jewellery around her slender neck, he also thought of the many times his lips had grazed the fine hairs along that neck, sending her into shrieks and fits of giggles. He decided against any adornments, letting the swoop of the red dress under her shoulder blades speak for itself. He thought back to the last time he’d seen Aurelia, in Casa Labra, a crowded and steamy restaurant and bar in one of Madrid’s many winding alleyways near Puerta del Sol. It had always been one of their favourite places–loud, boisterous and full of amazing food with the best croquetas in Madrid. As he ordered their usual croquetas and bacalao, he spied her weaving through the crowd towards the back of the shop where there was usually a little more breathing room. He followed her through, snaking in and out of the throngs. She sat on a barstool at the very back against the wall, eyes rimmed red. Andreas’s heart had dropped into the pit of his stomach and he wanted to turn and walk out of Casa Labra before she could say a word, before she could end it all. That was it–the painting was finished. He placed his brush in the easel’s tray and sank to the bed. Andreas felt a sense of tiredness that wasn’t sleepiness, but instead fatigue. He’d spent the first day in London wandering the streets, searching for answers. He knew he wouldn’t find Aurelia simply walking down a street or shopping in Tesco, but you could never be sure. She hadn’t said when she was going or where in London she’d be, just that she needed a break from him and wanted to move to London to start a new life. It was all desperate guesswork. He’d even sat in the middle of Piccadilly Circus for hours that first evening, hoping against hope that the old adage about how if you sat long enough in the midst of the hustle and bustle you’d see someone you knew. He only knew Aurelia in London, so she had been his only option and only hope. Not knowing what else to do with himself, he’d checked into a nondescript chain hotel in Kensington, dropped by an art supply store, and did what he knew best. He painted. Andreas had tried several different paintings, never stopping even for sleep, and they all turned out more inaccurate, more wrong than the one before. Her eyes were too dull in one. In another her smile was crooked. In yet another monstrosity the colour of her skin was at least two shades too light. He had been down to his final canvas when he gave in and painted her as he had last seen her: from behind as she walked away from Casa Labra, from him and from their life together. As I mentioned at the top, this is my first ever submission to the speakeasy so be gentle! The rules and prompt can be found here. Here’s to a new and fun challenge for 2013! Oh, heartbreak! Poor Andreas… I hope he finds her! And thank you for joining us in The Speakeasy! Thanks so much… happy to be here! Wonderful! I always have trouble finding the descriptives I really mean when I write. “Cafe au lait skin”? “Swoop of the red dress”? Perfect. Thanks so much! I’m really happy I took the plunge and submitted… everyone’s so lovely! great imagery. i feel for the guy! I liked the image of him waiting in one spot long enough to see someone even though there was only one person to know. So lonely. Welcome to you, too! Thanks! 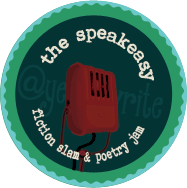 So excited to join the speakeasy! Welcome to the speakeasy! This is an awesome first entry. Your description of the painting was such a beautiful contrast to the starkness of the hotel room. My heart breaks for Andreas and I hope he finds her. Beautiful piece! Vivid and emotional. Great job! I love the international locations. Great mood to the piece. Nice descriptions. I care about him and wonder what happened. From one Steph to another, thanks! Well done. I could feel his emptiness. Heartbreaking. Oh the pain an artist can feel…..